This is a brand-new arrival from Brazil … and imagine my surprise when I discovered yet another whole new starbrary! 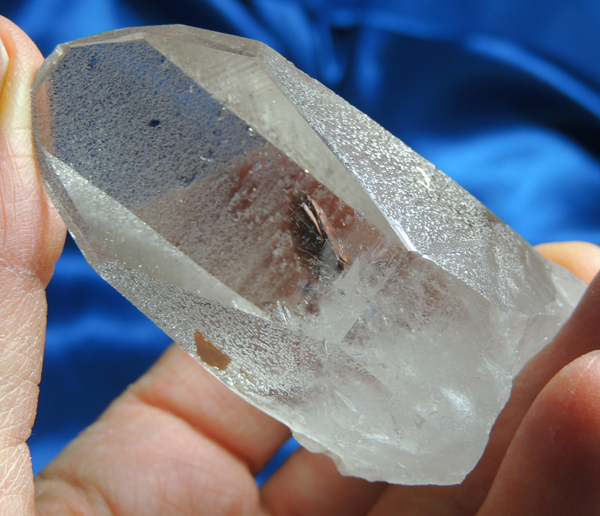 This one, like most in this lot, is a very clear and slightly smoky 2.9 oz, 2.5” by 1.3” by 1.4” quartz point with healed base that allows him to self-stand. His dominant face is an abundance (eight-sided)! Like the Libra, all sides have starbrary glyphs but some have sides only have a few. The glyphs are sweeping and seem to describe movement from top to bottom like flying saucers or some kind of space craft. You will see circles on his faces (a loupe will help) as well as many minute inscriptions that give him a “misted” look but he isn’t in the least. There is a small student at the edge of the base and a spectacular rainbow in the slight misting there. He is in excellent condition (only tiny dings) and looks forward to working with his special Keeper!